We have many remedies that are made from the basic elements of the periodic table. We also have remedy compounds made from the combination of these elements. Because the elements are the basic building blocks of all matter then it makes sense that they would also be the building blocks for many of our homeopathic remedies. Lets explore the elements. Jan Scholten has written a wonderful book Homeopathy and the Elements. In it he has explained the seven series and their significance and relationship to man. These series correspond to the 7 rows of the periodic table. He has also described the 18 stages of our life cycle and how this corresponds to the 18 rows across the periodic table. There is infinite wisdom in the periodic table and is one of the maps to all creation. Series 1 – Hydrogen – Hydrogen to Helium – Conception, A sense of unity and oneness, unborn. Being born into this world. Series 2 – Carbon – Lithium to Neon – Who am I? Individuality, Like a toddler discovering themselves. Series 3 – Silicium – Natrium to Argon – Family and relations. Like a teenager, Home, the neighborhood and friends. Series 4 – Ferrum – Kali to Krypton. The village, trade, profession, young adult. Series 5 – Silver – Rubidium to Xenon – Ideas, art, middle age. The region, county or province. Series 6 – Gold – Caesium to Radon – Power leadership. Ripe age. The country or the world. Series 7 Uranium – Francium to Plutonium – Magic. Old age. Invisible power. The world and the universe. Intuition. 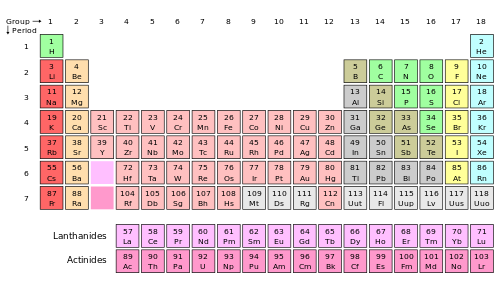 Stage 1 – Hydrogen, Lithium, Natrium, Kali, Rubidium, Caesium – The beginning. The instinctive response. Lonely and alone. A simpleton. Naive. Single minded and one-sided thoughts. Stage 2 – Beryllium, Magnesium, Calcium, Strontium, Barium – Finding a space, Observing, evaluating, criticising, Unsure, timid, shy. Joining the community. Finding one’s space. No confidence. Stage 3 – Boron, Aluminum, Scandium, Yttrium, Lanthanum – Comparing. Investigating, scanning, discovering. Doubt, hesitation. changeable, unstable. Discouraged. Stage 4 – Titanium, Zirconium, Hafnium – Establishing. Official foundation. Uncertain and indecisive. Stuck in the initial stages. Stage 5 – Vanadium, Niobium, Tantalum – Preparing. The front guard. Proposal, doubt. Temporary positioning. Unrealistic. Tantalising, Irresolution. Stage 6 – Chromium, Molybdenum, Tungstung – Challenge. Daring. Proving. Initiation. Force. They are ready to begin proving themselves but haven’t yet. Stage 7 – Manganum, Technetium, Rhenium – Practicing. Training extra skills. Doubt. Learning. Receiving feedback. Compliments. Cooperation. The theme of extending the knowledge they have so far. Series 8 – Ferrum, Ruthenium, Osmium – Perseverance. Endurance. Forceful. Opposition. Calculating and planning. Concentration. They are getting on with life and up to the task. Series 9 – Cobaltum, Rhodium, Iridium – Success is in sight. The final sprint. The final presentation. The finishing touches. Tests and blunders. Not quite. Calling it off. The last push to the top. Series 10 – Graphities, Silica, Niccolum, Palladium, Platinum – The Lord and Master. The summit. They have arrived. Success and glitter. Sure. Independent, Noble. Self confidence and haughty. Fixed, rigid. Self, self-confidence, self-satisfied and self-importance. Series 11 – Cuprum, Argentum, Aurum – Preserving. Holding on. Maintaining. Protecting. Possessions and wealth. Expansion. Holding on to that which they have achieved. Series 12 – Zincum, Cadmium, Mercurius – Division. Overshooting the mark. Exaggerating. Repetition. Pollution. Decay and decline. Enemies. They want to hold on to what they have achieved but go too far in holding on. Stage 13 – Gallium, Indium, Thallium – Withdrawal. Lagging behind. Outgrown. nostalgia. Out of date and stubborn. Withholding Suspicion, Loss of faith. Withdrawal and giving up. Stage 14 – Germanium, Stannum, Plumbum – Formal. Empty weak and drained. Eliminated and discarded. Diverting. Irresponsible. Indifferent. They become formal and distant. Stage 15 – Nitrogen, Phosphorus. Arsenicum, Antimonium, Bismuth – Loss. Bankrupt. Death, Surrender. Handing over and sacrifice. Forgiving. Poison. Refusing to believe that things really have come to and end. Stage 16 – Oxygen, Sulphur, Selenium, Tellurium, Polonium – Remembering. Lost. Rags and tatters. Expectations. Fantasy and make-believe. Reconciliation. Living on past resources. Lazy and neglect. They realize all is lost so they do not make the effort. Stage 17 – Flour, Chlorum, Bromium, Iodium, Astatinum – The end and letting go. Holding on. Demanding and controlling. Climax. Exiled. Condemned, Fleeing. The last act of letting go. Stage 18 or stage 0 – Helium, Argon, Krypton, Xenon, Radon – Rest This stage could be called stage 0. It is the final rest. Inactive. Retreat and cocoon. Locked up. Denial. Transformation. Free without ties. No ties to bind them to their former existence. Vega; Metalloids (265) : alum-acet., alum-m., alum-met., alumn., ant-ar., ant-c., ant-i., ant-m., ant-o., ant-s., ant-t., arg-cy., arg-i., arg-m., arg-m-am., arg-n., arg-o., arg-s., ars., ars-br., ars-h., ars-i., ars-i-merc., ars-met., ars-s-f., ars-s-r., ars-t-s., aur-ar., aur-br., aur-fu., aur-i., aur-m., aur-m-k., aur-m-n., aur-s., bar-acet., bar-c., bar-i., bar-m., beryl-m., bism-k-i., bism-met., bism-ox., bor., brom., cadm-br., cadm-f., cadm-i., cadm-m., cadm-s., calc., calc-acet., calc-ar., calc-br., calc-caust., calc-f., calc-hp., calc-i., calc-l., calc-l-n., calc-m., calc-o-t., calc-ox., calc-p., calc-pic., calc-s., calc-sil., carbn., carbn-chl., carbn-h., carbn-o., carbn-s., cer-ox., chr-ac., chr-o., chr-s., cob-chl., cob-n., cupr-acet., cupr-am-s., cupr-ar., cupr-m., cupr-n., cupr-o., cupr-s., ferr-acet., ferr-ar., ferr-c., ferr-cit., ferr-cy., ferr-i., ferr-m., ferr-ma., ferr-n., ferr-p., ferr-p-h., ferr-pic., ferr-prox., ferr-py., ferr-s., ferr-t., germ., graph., hafn., iodof., irid-m., kali-acet., kali-ar., kali-aspar., kali-bi., kali-bit., kali-br., kali-c., kali-chl., kali-chls., kali-chr., kali-cit., kali-cy., kali-f., kali-fcy., kali-hp., kali-i., kali-m., kali-ma., kali-n., kali-ox., kali-p., kali-pic., kali-s., kali-s-chr., kali-sal., kali-sil., kali-sula., kali-t., kali-tel., lant., lith-br., lith-c., lith-i., lith-l., lith-m., mag-acet., mag-aspar., mag-bcit., mag-br., mag-c., mag-f., mag-i., mag-l., mag-m., mag-mang-p., mag-n., mag-oro., mag-p., mag-s., mag-sil., mag-u., mang-acet., mang-gluc., mang-m., mang-met., mang-o., mang-p., mang-s., merc-acet., merc-aur., merc-br., merc-c., merc-cy., merc-d., merc-i-f., merc-i-r., merc-k-i., merc-n., merc-p., merc-pr-a., merc-pr-r., merc-s., merc-s-cy., merc-succ., moly., nat-ae-s., nat-ar., nat-bic., nat-br., nat-c., nat-cin., nat-eth., nat-f., nat-fh., nat-hchls., nat-i., nat-l., nat-m., nat-mar., nat-moly., nat-n., nat-ns., nat-ox., nat-p., nat-pyru., nat-s., nat-sal., nat-sel., nat-sil., nat-sil-f., nat-sula., nat-sulo., nat-taur., nat-tel., nat-uric., nicc-c., phos., phos-h., phos-i., phos-pchl., plat-m., plat-m-n., plb-acet., plb-c., plb-chr., plb-i., plb-p., plut-n., polo., rhen., rhodi-o-n., rubi., ruth., scan., sel., sil., sil-mar., stront-br., stront-c., sulph., tant., tech., thal-acet., thal-s., titan., uran-ar., uran-m., uran-n., vanad-f., vanad-m., vanad-o., vanad-s., yttr., zinc-acet., zinc-ar., zinc-br., zinc-c., zinc-chr., zinc-cy., zinc-fcy., zinc-gluc., zinc-i., zinc-m., zinc-o., zinc-p., zinc-pic., zinc-s., zinc-val., zirc. A book could be written about each of the elements and metalloid remedies. Use this article as a overview guide to your studies. If you searched each of these remedies you will find that not much has been written about some of them. But using the concepts that Jan Scholten has offered, you will be able to come to very good understanding. Still as in all cases the biggest challenge is understanding what is asking to be healed in the client. Once that is fully understood, then if you firmly believe that it is a mineral remedy, this guide may help you find that strange, rare and peculiar remedy for the person. Let the studies begin. Knowledge has no limits but life span is limited. I salute those who try to fathom the limitless within their limited time. What % of homeopathic remedies come from the elements? Excellent description of the Periodic Table.